When Art Spiegelman's Maus-a two-part graphic novel about the Holocaust-won a Pulitzer Prize in 1992, comics scholarship grew increasingly popular and notable. The rise of ""serious"" comics has generated growing levels of interest as scholars, journalists, and public intellectuals continue to explore the history, aesthetics, and semiotics of the comics medium. Yet those who write about the comics often assume analysis of the medium didn't begin until the cultural studies movement was underway. 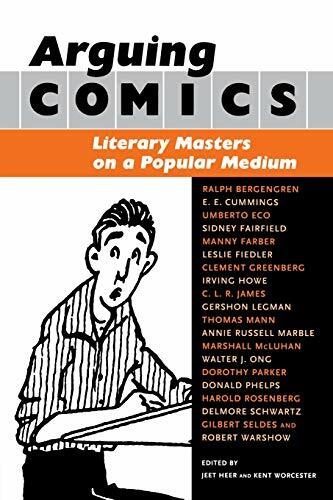 Arguing Comics: Literary Masters on a Popular Medium brings together nearly two dozen essays by major writers and intellectuals who analyzed, embraced, and even attacked comic strips and comic books in the period between the turn of the century and the 1960s. From e. e. cummings, who championed George Herriman's Krazy Kat, to Irving Howe, who fretted about Harold Gray's Little Orphan Annie, this volume shows that comics have provided a key battleground in the culture wars for over a century. With substantive essays by Umberto Eco, Marshall McLuhan, Leslie Fiedler, Gilbert Seldes, Dorothy Parker, Irving Howe, Delmore Schwartz, and others, this anthology shows how all of these writers took up comics-related topics as a point of entry into wider debates over modern art, cultural standards, daily life, and mass communication. Arguing Comics shows how prominent writers from the Jazz Age and the Depression era to the heyday of the New York Intellectuals in the 1950s thought about comics and, by extension, popular culture as a whole. An anthology charting the long-standing cultural debate that comic books sparked With substantive essays by Umberto Eco, Marshall McLuhan, Dorothy Parker, e.e. cummings, C.L.R. James, and others When Art Spiegelman's Maus - a graphic novel on the Holocaust - won a Pulitzer Prize in 1992, the ongoing debate about comics and the rise of the 'serious' comic was cranked up a gear. There has been an assumption that analysis of the comic book medium didn't begin until the cultural studies movement was underway. Arguing Comics shows this to be inaccurate by bringing together two dozen essays by major writers and intellectuals who analysed, embraced, even attacked comic strips and comic books in the period between the turn of the century and the 1960s.